I grew up with Jell-O on a regular basis and I loved it. Jiggly jigglers, creamy confections with hunks of fruit in them at holidays, beautifully molded mounds to be sliced into. I loved it all. Knowing what I know now I couldn’t possibly consume all that artificial food coloring, flavoring and sugar. I’ve had a canister of Great Lakes unflavored gelatin in the cupboard for a few years now, though, because I have wanted to try to create healthy versions of my childhood Jell-O favorites. So here is my first success. It was so easy I don’t know what I have been waiting for all this time! Put ¼ C. water in a little heat-safe bowl and sprinkle the gelatin on top, shaking the bowl a little to get the gelatin moistened. Set aside. Put fruit in food processor or a deep container to blend with a hand blender. Blend up fruit, add cream cheese and honey and blend again. Taste and adjust sweeteners. Bring 2 inches water to simmer in a small saucepan. Place small bowl of gelatin in it and whisk for 30 seconds to 1 minute until all gelatin is melted and the gel has become liquefied. Pour into fruit mixture slowly while blending a little more to incorporate. 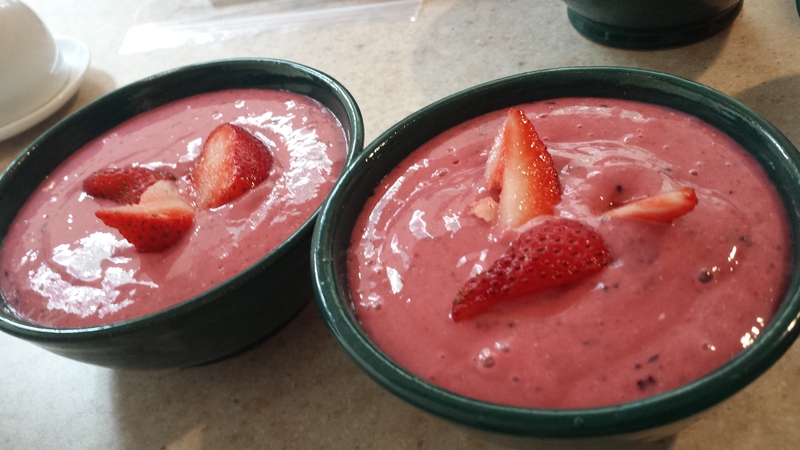 Pour mousse into individual cups and refrigerate for at least 4 hours. Garnish with fresh fruit and/or mint leaves. 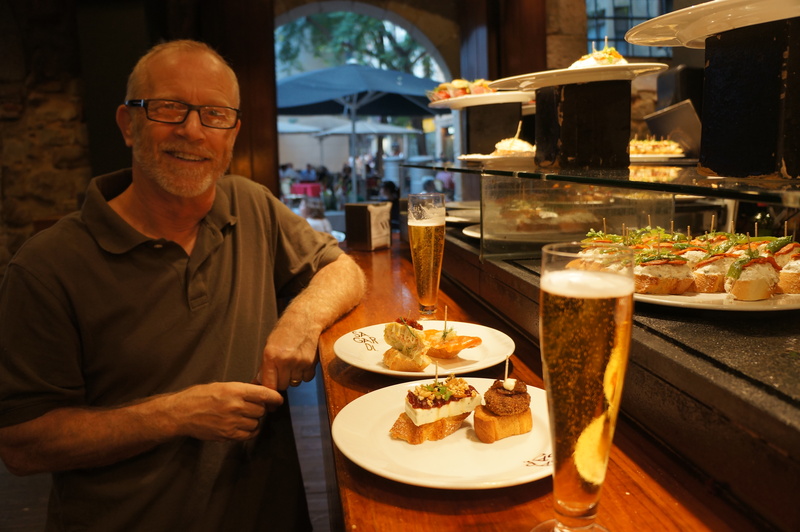 Tapas in Barcelona are definitely designed for the tourists. Everything has a toothpick in it. Grab a plate take what you want, save the toothpicks. When finished take the plate with the toothpicks back and they charge you accordingly. It’s a good system, the bites are interesting and not too expensive, if a little contrived, everything on top of a piece of white bread. Madrid’s tapas bars were definitely less polished, more like actual little local joints where each specialized in something special and delectable. Barcelona’s tapas were pretty much the same no matter which place we chose. Our first day or 2 we did quite a bit of eating at these places. But we were hungry for some authenticity. 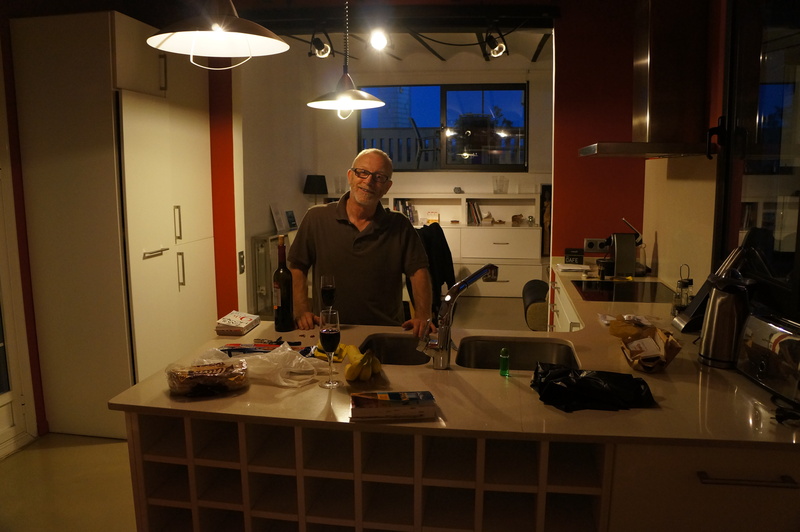 And we had a whole kitchen back at the apartment! We started scoping out markets. 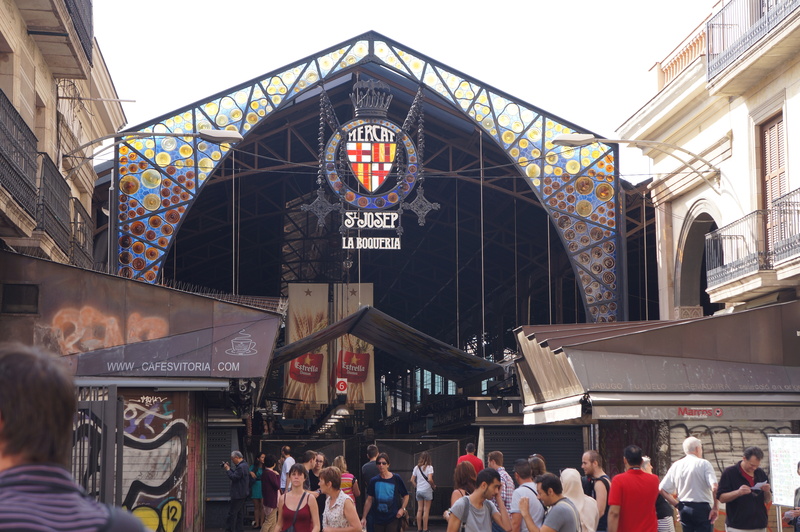 Of course we went to La Boqueria on las ramblas, probably the most famous market in Barcelona. We took the guidebook’s advice and avoided the sellers near the entrance to get deep into the place and find the less tourist-oriented merchants. 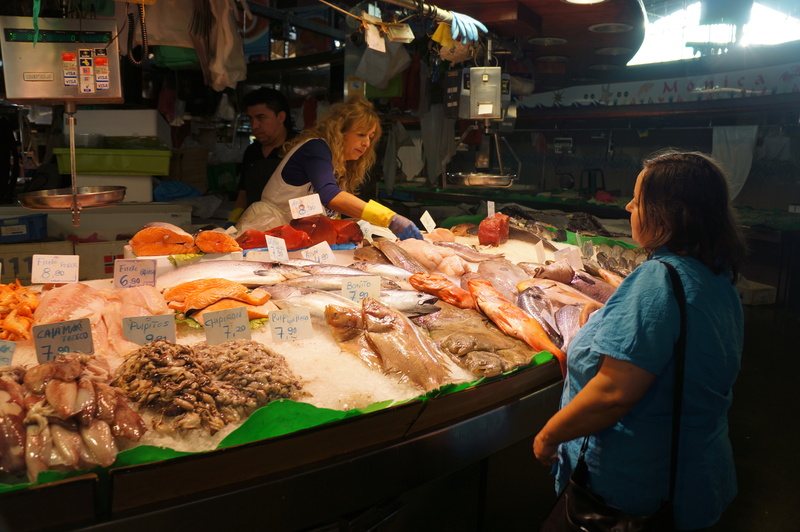 We found the discount-fishmonger there. If you would buy the whole piece of whatever fish he had you would get an amazing price! It took a bit of stretching my knowledge of Spanish to get this understanding, but once my brain connected the dots we cashed in. So for 2 nights in a row we went and bought the whole hunk of tuna the guy had. 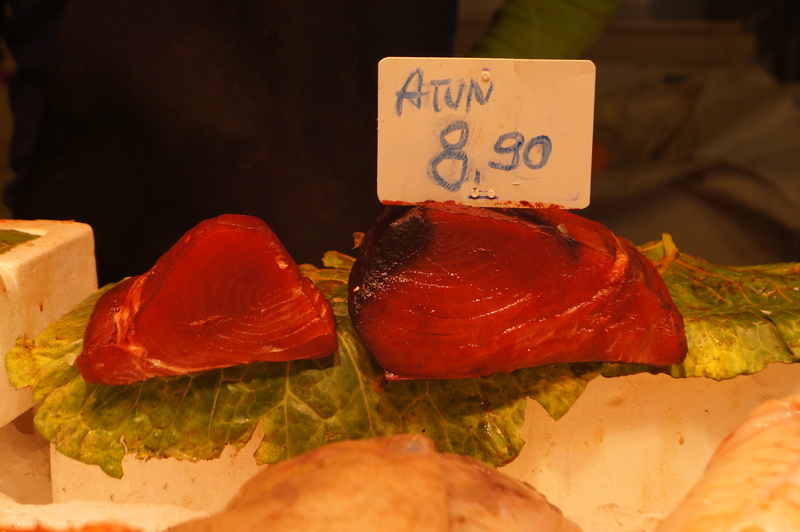 For about $20 we gorged on fresh tuna for several meals! It was a fun find. train. For the extra $20 or so we had a little plusher seats and our own electrical outlets to recharge our devices. Since we don’t fly first class it seemed like an affordable treat. We seemed to fly to Barcelona from Madrid, making the trip in about 2.5 hours at right near 200 mph! 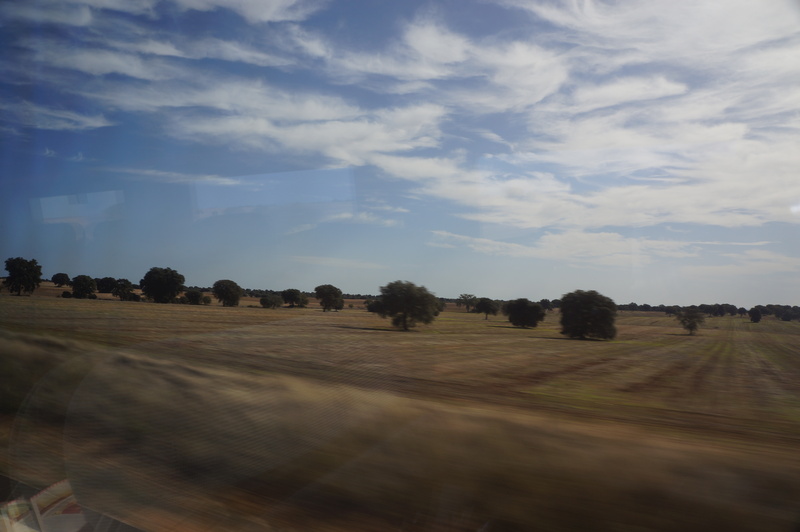 It was truly exhilarating to watch the Spanish countryside whizzing by. It was a much different view than we had just had of the big city. 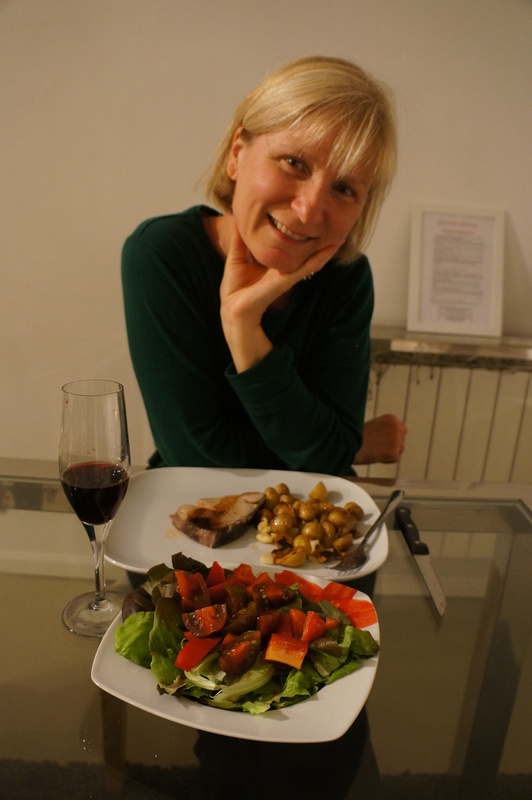 When we arrived and settled into our apartment we headed out for tapas. We were quick to discover Barcelona is very different than Madrid. It was the end of October and the place was jammed packed with tourists. This was a little overwhelming to us. We purposely travel off-season or almost off-season to try to avoid the crowds. I wonder if Barcelona ever really has such a time.